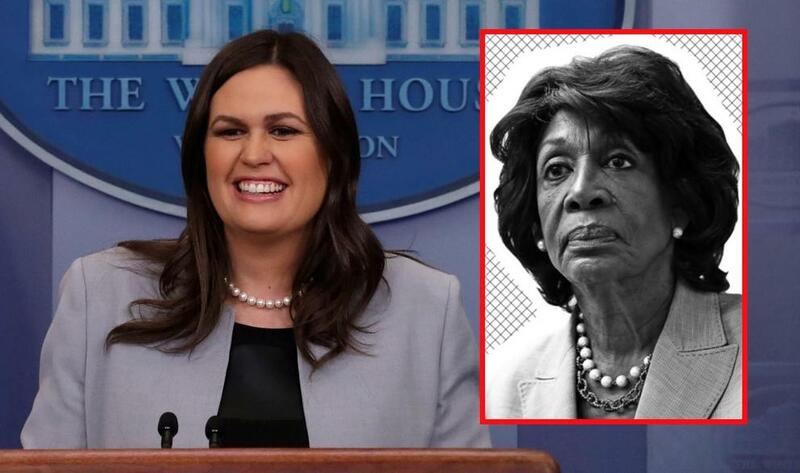 For the first time in the history of the country, the White House press secretary requires protection from the Secret Service after calls for violent attacks against her by left-wing extremists like Maxine Waters threaten her very safety. White House press secretary Sarah Sanders has been harassed everywhere she goes and even thrown out of restaurants simply because of the administration she works for. The closest the Secret Service would come to acknowledging the situation was a statement to CNN saying, "For operational security purposes the Secret Service does not comment on its protective operations." Since Sanders was discriminated against at The Red Hen restaurant, she said during Monday's White House briefing she and her husband "politely left." Sanders went on to say, "I was asked to leave because I worked for President Trump. We are allowed to disagree but we should be able to do so freely and without fear of harm, and this goes for all people regardless of politics. Healthy debate on ideas and political philosophy is important, but the calls for harassment and push for any Trump supporter to avoid the public is unacceptable." Sanders was referring to a recent call for violence by Maxine Waters who said, "If you see anybody from that Cabinet in a restaurant, in a department store, at a gasoline station, you get out and you create a crowd and you push back on them! And you tell them that they are not welcome, anymore, anywhere." Judicial Watch was adamant that Water's speech did not qualify as free speech and in fact incited violence. "This is not about Waters’ freedom of speech. It is not even an example of yelling 'fire' in a theater. It is about inciting mob violence. The House needs to act quickly to hold her accountable for this dangerous incitement," Judicial Watch said. Investigative journalist Laura Loomer is also holding Water's feet to the fire and attempted to confront her in person about her remarks. The result was a very rude and violent response from Waters which has led to Loomer pressing assault charges against Waters. Waters has been a U.S. Representative for California's 43rd congressional district since 2013 and officials are calling for an investigation into her incitement of violence. What Waters is doing by calling on her followers to harass and assault American citizens makes her an extremist leader of a terrorist group under the U.S. Code of Federal Regulations which defines terrorism as "the unlawful use of force and violence against persons or property to intimidate or coerce a government, the civilian population, or any segment thereof, in furtherance of political or social objectives." Maxine Water's recent statements certainly fit the bill. Perhaps Trump should send the bill for Sanders extra security detail to Waters. So why isn't Maxie Mouth under arrest for Terroristic Threats? Does the Far Crazy Liberal Left have Immunity or are they just above the Law given the number of Deep State DOJ staff?